"Habitat, climate, and genetics play a huge role in the way feather color and pattern develop," explains lead author Eliot Miller at the Cornell Lab. "Species in similar environments can look similar to one another. But in some cases, there's another factor influencing the remarkable resemblance between two woodpecker species and that's mimicry. It's the same phenomenon found in some butterflies which have evolved markings that make them look like a different bad-tasting or toxic species in order to ward off predators." Study authors combined data on feather color, DNA sequences, eBird reports, and NASA satellite measures of vegetation for all 230 of the world's woodpecker species. 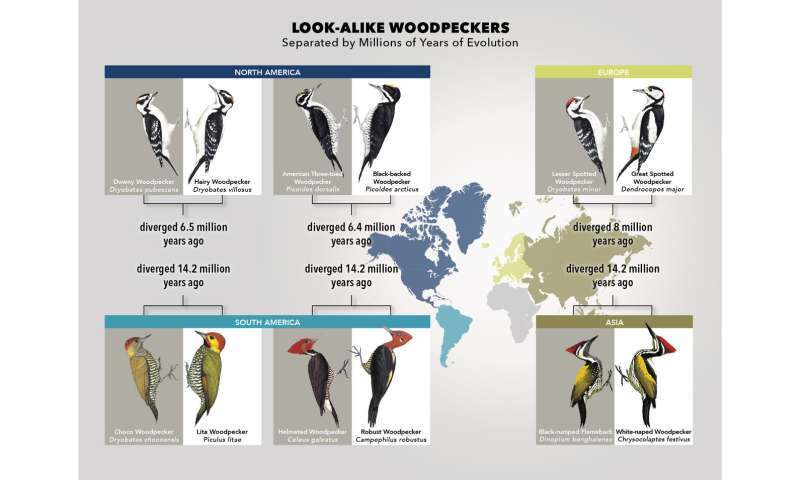 It became clear, Miller says, that there have been repeated cases of distantly-related woodpeckers coming to closely resemble each other when they live in the same region of the globe. Though not part of the study, Miller's take on the reason for woodpecker dopplegangers is that downies that look like the larger, more aggressive Hairy Woodpeckers might make other birds, such as nuthatches and titmice, think twice about competing with the downy for food. Some evidence supporting this idea has been found in observational studies but field experiments would be needed to more conclusively test this hypothesis. "It's really fascinating," says Miller. "And it's pretty likely this is happening in other bird families, too. I first got interested in this question a decade ago from looking through bird books. I wondered how the heck some distantly related species could look so much alike—what are the odds that it could happen just by chance?" Infographic: Why don't woodpeckers get headaches?